- A large high rise with 20+ Guesthouses in the one building. 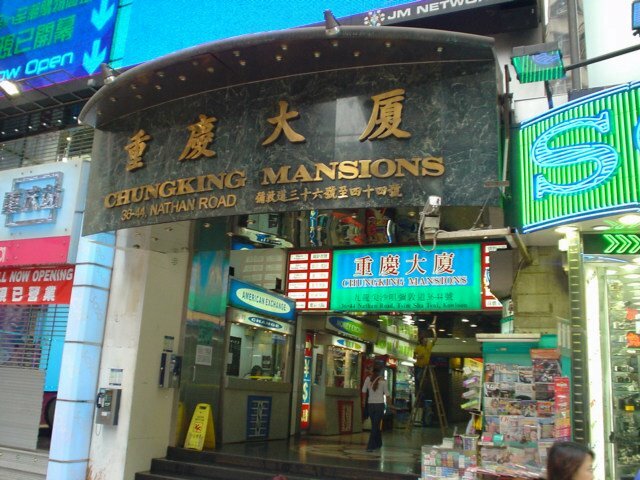 I have arrived, I am in the center of the Backpacker Universe for Hong Kong, or maybe they would say Kowloon. -Metro, Underground or Subway as you wish to call it, it the train that goes around the city, they call it the MTR. You come up the stairs from the MTR stop at Tsim Sha Tsui and look across the street and you will see on the building. Chunk King House, then below you will see entrance where you will see the Sign Chunk King Mansions. They do not speak English good here, better than Macau. If I want directions then I need to say a place everyone can understand. Chunk King Mansions at the Tsim Sha Tsui - MTR Stop, not if that was on a little card and in Chinese and English I would have a better chance. Nonetheless you can print out these photos if you wish and they have the name written I hope in Chinese. The Lonely Planet Guidebooks is annoying, it talks about smell, cockroaches and rats, I think the guy is limp wristed and lives in a Posh Posh hotel with ... For sure you can probably find that in this building however you have many choices and this has got to be one of the best choices to live in Hong Kong. Easy, quick, understandable, cheap, and many choices, you could probably skip Macau and come directly here from the Plane as you do not have to walk anywhere but inside the subway. Too easy in many ways, however you are still in China and they speak Chinese with a rock solid China face. I have became pretty good at spotting the Philippine or India people here to ask questions or get an upscale richer person and they may speak English.